I'm so glad I got to do a video with my sister, Jeanie. She's the most amazing cook and she decorates the most beautiful cakes!!! I asked her if she'd mind showing me a few simple techniques. No, I won't go into the entire process of "this is how you bake the cake, and this is how you make the icing", etc. I figured I'd jump ahead a little and ask Jeanie to show us a basket weave design, and a few borders. Now, I know there are portions of the video where you can't really see what she's doing. That's OK. My goal is to just give you a little intro into the art of cake decorating and hopefully inspire you to dabble a little. That's what I did! I went to a craft store, went over to the cake decorating section and picked up a few of the basic supplies. I honestly had no idea what I was doing. I bought a piping bag and a star tip. Then I came home, made some butter cream icing and practiced making swirls on a plate. Before I knew it I was trying specific techniques and decorating cakes for friends. Like I've said before, I've never had any formal training in cooking and that includes cake decorating. I just like to try things and learn as I go. Jeanie, on the other hand, has taken classes and has become quite good at what she does! Here is a picture of the finished cake from the video. She made it for Ros's birthday and I think you'll agree that it's BEAUTIFUL! Notice the shell border around the base, the basket weave up the sides, and the reverse shell border around the top. Pretty amazing, huh? With a little practice, you could do this too! If my video isn't clear enough for you, you can learn more techniques from Wilton.com. They seem to have written the book on cake decorating. Thanx again to Jeanie and also to Aniell for making this video possible! 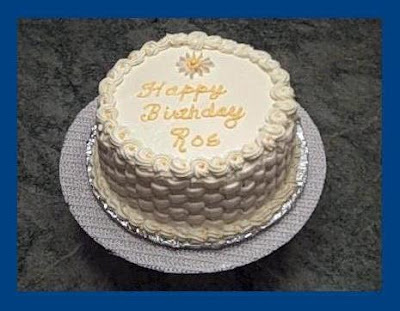 And Happy Birthday Ros!